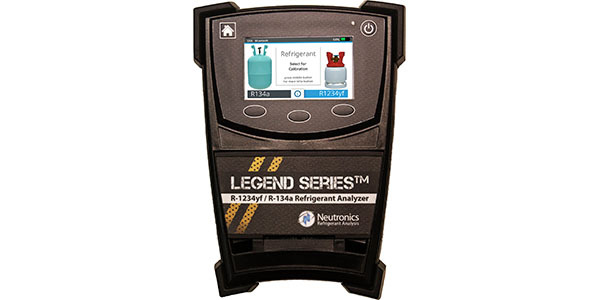 Neutronics Inc. recently announced the launch and immediate availability of its Legend Series analyzer designed for use with R-1234yf, R-134a and R-12 vehicles and cylinders. 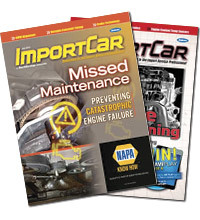 Refrigerant counterfeiting, cross contamination and illegal retrofitting are serious concerns for vehicle OEMs and shop owners alike and the high cost of R-1234yf makes it a prime target for these nefarious practices. With 84 million R-1234yf vehicles on the road, if you are not already servicing R-1234yf cars, you will be very soon. The Legend ID is a worldwide ready tool to meet the service needs of R-1234yf, R-134a and R-12 equipped vehicles. Certified to the SAE J2912 standard, it connects directly to SAE J2843 and J3030 AC Service machines that have an external analyzer USB port. With no less than ten built in languages, a 5 in. color display and the ability to test R-1234yf, R-134a and R-12, the Legend is the universal AC refrigerant analyzer ready for any vehicle in any location around the world. Soft touch input keys along with a tough ABS display window and rubber bumper corner protection make the Legend ready for the often-harsh environment of the repair shop. Other features include an internal lithium battery, optional printer and Bluetooth output as well as a rugged storage case. A one-year warranty is provided on all product versions. All Legend series analyzers are supplied with the base unit, a universal AC power supply, R-134a and R-1234yf couplers, two sample hoses each for both R-134a and R-1234yf, a USB cable, tank adapters for both R-134a and R-1234yf all housed in a rugged storage case. An R-12 hose is available separately. For additional information, visit Neutronics.